Seriously? OMG! WTF?Speechless Archives - Seriously? OMG! WTF? 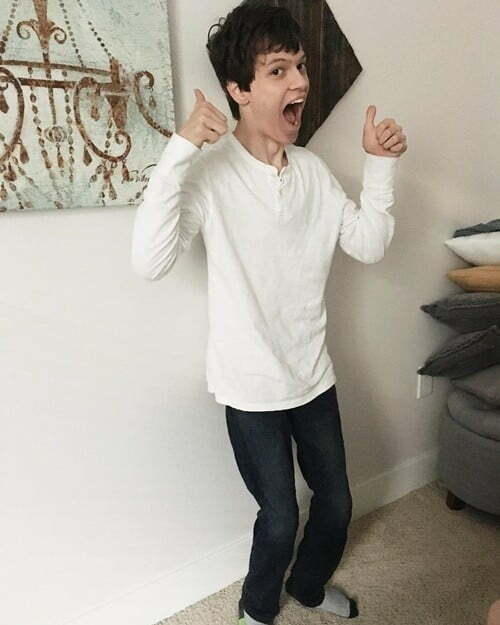 Speechless’ Micah Fowler can stand on his own! Micah Fowler not only plays a person with cerebral palsy on Speechless, but he also has it. Yesterday, he shared the above photo and revealed a big accomplishment he has been making. He explained, “I have the day off so I’m practicing my balance against the wall! Been working hard with my trainer this season! #progress ” Unbelievable progress! Today, is his 21st birthday and he has so much more to celebrate than being able to drink legally, he also gets to celebrate this huge achievemnt. I don’t know the actor personally, but I am so proud of him. I love his never give up spirit. We can all learn from him and we should. Last year, ABC didn’t think that they needed sitcoms on Friday and they were very wrong. Therefore, they are making TGIF a thing again. Remember in the ’90s our Fridays nights were full of Perfect Strangers, its spinoff Family Matters and Boy Meets World? Now in 2018, it is about ’90s based sitcom Fresh Off the Boat and modern-day’s Speechless. Thus, someone at ABC thought it would be cool to merge the two eras with stars from the past and present. They are PS’s cousins Bronson Pinchot and Mark-Linn Baker, everyone’s favorite dad Reginald VelJohnson from FM, BMW teen dream queen Danielle Fishel, FOB’s Constance Wu and Randall Park, and Speechless’ John Ross Bowie and Cedric Yarbough. You know if ABC were smart, they would do a massive revival of their old shows. Seeing the stars from yesteryear makes me miss them and Dinosaurs. I want my baby back because you gotta love him! Until then I will be spending my Fridays with Fresh Off the Boat and Speechless starting on October 5th at 8p. Minnie Driver is back filming Will & Grace this week. During a break, the actress and Debra Messing had some selfie fun. They took several photos together making many different faces that leave us speechless with joy. They sitcom stars showed us not only can they make us laugh with their acting, but they can also do it with their faces. Which is very important for comedic actors. Will & Grace is back on NBC October 4th and Speechless returns the following night on ABC. We are about two months away from the start of the fall season on broadcast TV, but the shows are already filming now. Speechless has a bloody good season premiere in the works. To start off their third season, they are going to London to meet Maya’s (Minnie Driver), estranged dad. Some Bloke named John Cleese. If you are going to go to England for a 2-part storyline, where are you going to go? Of course, they are going to go to Buckingham Palace. Here are Micah Fowler (and his real mom), John Ross Bowie and Cedric Yarborough posing outside the historic location. This one photo has me so excited, I cannot wait to see what trouble the DiMeo family gets into when they are overseas, Friday, October 5th and 12th on ABC. Mark your calendars because you do not want to miss this jolly good time. Speechless has twice the voice tonight! ABC is airing two episodes of Speechless tonight starting at 8p and it is twice the joy! For the first episode, Maya (Minnie Driver) gets jury duty. While you and I would hate it, she is so excited for the opportunity. Why? Because she gets away from her family, of course. Only problem, her arch nemeses (Sarah Chalke) also got picked. Now the two of them try to get the judge to dismiss the other one. He decides to keep them both on the jury. What happens next? You have to see it to believe it. JJ (Micah Fowler) meanwhile, decides to try dating. He sets up dates at a coffee shop and he has Kenneth (Cedric Yarbrough) help him out if needed. They come up with a plan that if he does not like the girl, he will toss his coffee to the ground. How many coffees get tossed the ground? Finally, Ray (Mason Cook) feels that is father (John Ross Bowie) is spending more time with Dylan (Kyla Kenedy) than him. Therefore, he tries to come up with new ways to win back his father’s love. Will it work? Then at 8:30p, JJ gets to direct his first movie at school. Everyone has an opinion and his movie goes to hell. Will he get his horror movie back on track? Especially since Ray thinks being in the movie will help win Taylor back. Dylan meanwhile finds out a secret about her mom when she watches a tape that she thinks is her parents wedding video. Why was her mom wearing a wedding dress for a man Dylan doesn’t know? Maya will do anything and everything to keep her secret. And I mean that. Finally, Jimmy helps out his neighbor who is renovating his house. It all works well until it doesn’t. And when it doesn’t, it goes really bad. Really, really bad. But what goes really, really good is these two episodes of Speechless. I love this show so much because not only is it funny, it helps to normalize cerebral palsy. Something that is so important for television do and they do it right.